Snake print is the new leopard print and this top is a soft, jersey, stretch and super comfortable with a cross over drape at the front. The snake top also has a long sleeve. Wear with tailored pants and a blazer for work add some heels to go to dinner. Or double up and wear with our snake pants. 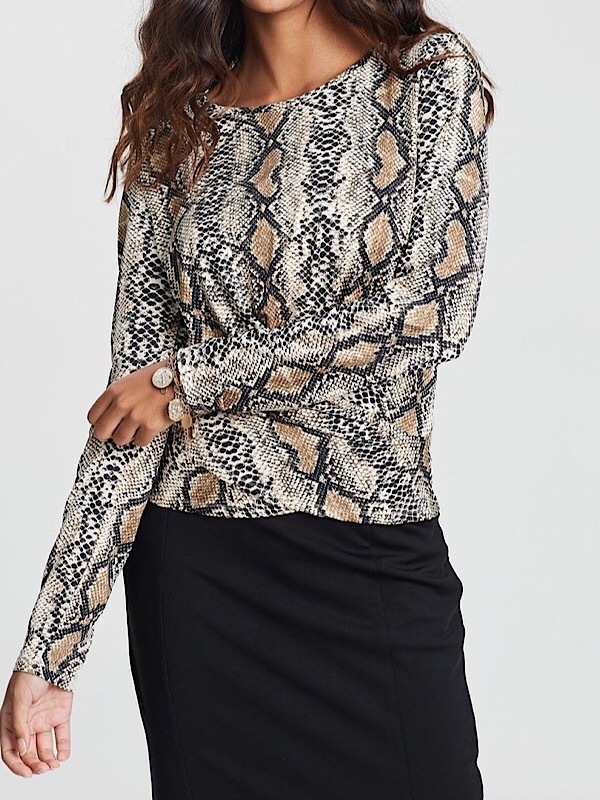 Snake print is the new leopard print and this top is a soft, jersey, stretch and super comfortable and features a cross over drape at the front. This top also has a long sleeve, a round neck and is in brown tonings. Wear with tailored pants and a blazer for work add some heels to go to dinner. Or double up and wear with our matching snake pants in brown. In addition, it is a great top for travelling as it is lightweight and doesn’t crush.